I don't know about you, but I really hate it when I have dinner all planned out and then discover, AS I'm cooking, that I've forgotten an ingredient. And if it doesn't ever happen to you, I really don't want to hear about it! Sometimes I have to improvise and other times, I'm able to pull off a miracle...like recreating an ingredient I usually buy pre-packaged. 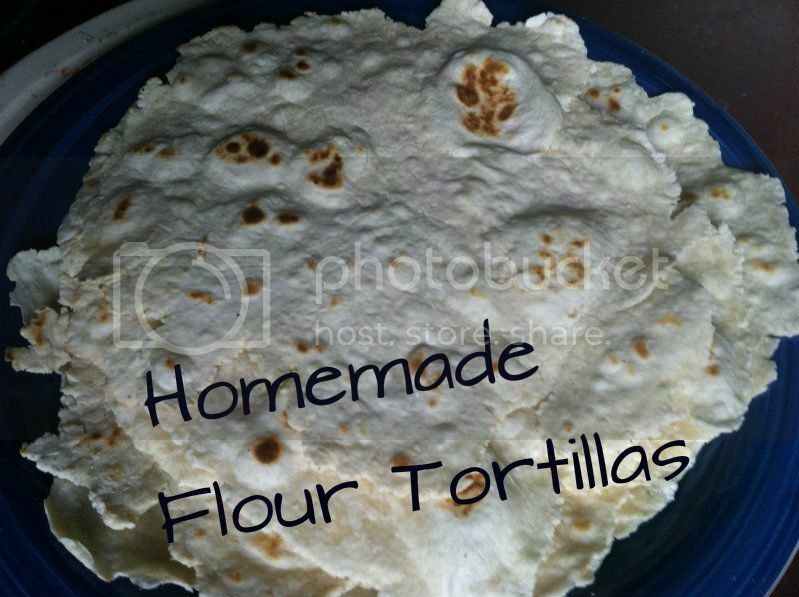 One of the easier things to make in a crunch are flour tortillas. Keep in mind, these won't always be round ... in fact, they are so not round, you're supposed to call them RUSTIC...because calling things RUSTIC makes all things falling apart and not quite right, seem positively STYLISH. The trick to getting your flour tortillas somewhat round-ish, is rolling them out on waxed paper, first from the middle making an X, then from the bottom and then across like a +. Do this a few times and the tortillas will be more round than blobby. You won't get a perfect edge, but that's what kitchen scissors are for...trimming. If you can't make it, fake it, right? I make my tortillas while I'm cooking the rest of dinner. For me, it's usually faster to make tortillas than it is to get through WalMart at 5 pm for one thing. As if that's ever going to happen. Mix the dry ingredients in a large bowl. Add shortening, cutting in until the flour resembles cornmeal, using a fork or your hands. Hands are easier. Even better is if you have a food processor. Add the water to the mixture a little at a time until the dough is soft and not sticky. Place the dough on a lightly floured surface and knead the dough for a few minutes until smooth and elastic. Divide the dough into 8 equal pieces and roll each piece into a ball. Let rest, covered with a towel, about 15 minutes. I sometimes skip this step, because I'm in a hurry. Use a rolling pin to roll each dough ball into a thin tortilla, starting at the middle and going up to the upper right at an angle, then center to the upper left...center to lower right, center to lower left. Next. start at the bottom and roll up, then roll across. Do this until the tortilla is thin. Place the tortillas one at a time into the skillet and cook until bubbly and golden, about 1 1/2 minutes. Flip the tortilla and continue cooking until golden on the other side. I love homemade tortillas. Great recipe. I'm your newest follower. I have a link party on Wednesdays, and I would love it if you would link this post. It is called Wednesdays Adorned From Above Link Party. Flour tortillas are something I've wanted to try and make for a long time. I find that I've forgotten an ingredient all the time when I'm cooking and it drives me crazy. I used to throw a dramatic hissy fit and insist that my husband pick up dinner on his way home. But I've learned to improvise and have found that being creative sometimes makes food turn out better. Looks delicious. I would like to invite you to enter my HomeGoods 50 dollar gift card giveaway. The card can be used at TJ Maxx and Marshalls as well.